The boys and girls Rio Hondo League hoops season tips off tonight with an interesting slate. South Pas vs. La Canada in both boys and girls is gonna go a long ways toward determining the league champ. That’s my take, anyway. Here are the not-so-fearless predictions … why? Because this blog is booooorrrrrrrrinnnnnggggg. Thanks for reading! 1. 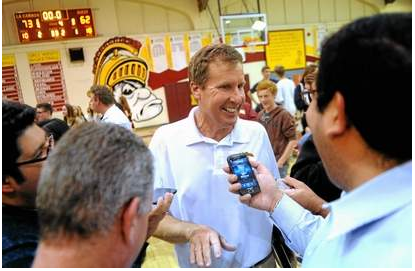 La Canada — Sparty can get their shots, can they knock ’em down? 2. South Pas — The win at Glendora stands out. But was it their peak? 3. Temple City — “TC by 2” – Mike Tomasulo circa 1990. 4. Monrovia — Long-term, Goldstein turns this program around. 5. San Marino — Yeah, I’m not buying the record. 6. Blair — Back in the day … this isn’t back in the day. 1. La Canada — It’s the system, stupid. 2. South Pasadena — Proved last year they can bang with LC. 3. Temple City — Decent, but appears to be a bit behind top two. 4. San Marino — Have to think Titans are better than record. 5. Monrovia — Would have better chance if they played defense. 6. Blair — Uh, yeah, they’ve played five games. Keppel 62, San Gabriel 38 — The Aztecs got a rare competitive game in the Almont League, but Sophia Song scored 24 points and Keppel pulled away thanks to a 13-0 run to close the third quarter. Keppel was playing without starting point guard Lauren Saiki, who is out with a knee injury. Flintridge Prep vs. Charter Oak, 9 a.m.
South Hills vs. Alta Loma, 10:30 a.m.
Murrieta Valley vs. Walnut, 1:30 p.m. Colony vs. La Canada, 3 p.m.
Glendora vs. California, 4:30 p.m.
Mission Viejo vs. Damien, 6 p.m.
Etiwanda vs. ML King, 7:30 p.m.
Los Osos vs. Claremont, 9 p.m.
San Marino vs Beverly Hills, 1:30 p.m.
Pacific Hills vs Valencia, 3 p.m.
Maranatha vs Highland, 4:30 p.m.
Campbell Hall vs Price, 6 p.m.
Serra vs Cantwell-Sacred Heart, 7:30 p.m.
La Salle vs Bell Jeff, 10 a.m.
St Francis vs Campbell Hall, 11:30 a.m.
West Ranch vs Taft, 1 p.m.
Cathedral vs Highland, 2:30 p.m.
Hart vs Oaks Christian, 4 p.m.
Cantwell-Sacred Heart vs Sierra Canyon, 5:30 p.m.
Bishop Montgomery v J.W. North, 7 p.m.
Chino Hills vs El Camino Real, 8:30 p.m.
Leuzinger vs Palm Springs, 11:30 a.m.
El Modena vs St Joseph Santa Maria, 1 p.m.
Windward vs Bullard, 2:30 p.m.
Pacific Hills vs Westminster, 4 p.m.
Crenshaw vs Foothills Christian, 5:30 p.m.
Dorsey vs Brentwood, 7 p.m.
Price vs View Park, 8:30 p.m.
La Canada’s Tom Hofman wins 600th game — La Canada legend Tom Hofman won his 600th game as the Spartans beat La Salle on Friday. Arcadia 50, Burbank 40 — This was a biggie as far as the Pacific League girls hoops race goes. The Apaches built a 13-point lead in the fourth, then held off a mild Burbank rally.